Hector's Latest Take on My Cake--The Pavarotti! This brilliant labor of love by Hector Wong just had to be shared with all of you. From Hector: In my opinion, Rose's Baking Bible Chocolate Pavarotti Cake is the best butter cake, chocolate flavored, there can possibly exist. I will explain the science after a little personal writing below. By the time you read this posting, I will be traveling to my 30th high school reunion, in Peru, with the cake. This is an important anniversary for me, because I say: "it will be the last high school reunion that I will sport hair on my head, as well as, the same waist line of 30 years ago." Next year, I will let myself go! On the serious note, this year my canoe club lost more than a few paddlers from all sorts of heart attacks and strokes! This made me commit to paddle more, and roar for the people that left us too soon an open seat on the boat. I think of them all the time. As a joke, I tell my buddies that I am training harder because I want to fit on my suit for my high school reunion! The Chocolate Pavarotti is a butter cake where part of the butter is replaced with white chocolate (the serious ones containing pure cacao butter). Using white chocolate in the cake batter makes the crumb absolutely perfect because white chocolate is an emulsifier. Also, the cacao butter in white chocolate remains solid at much higher temperature than butter. The cake crumb is fine, slices like a dream, looking like it will crumble, but it remains put. I can lift a slice with two fingers without breaking. 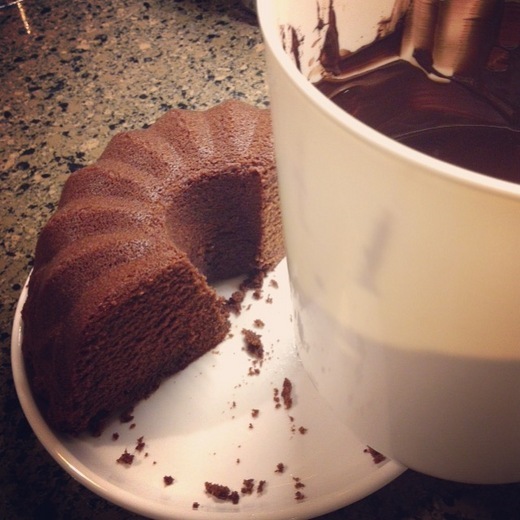 I modified Rose's recipe to fit a 10-cup bundt pan. To counteract the narrow widths of a bundt cake pan, I increased the ratio of baking powder. It turned very very very well. 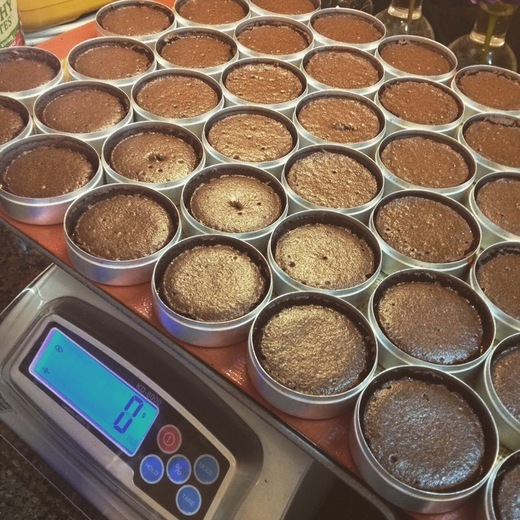 Then, I mixed a double batch of my bundt cake recipe, and baked 120 micro cakes, each on its own 2-inch by 7/8-inch cake pan. I am so pleased HOW LEVEL my micro cakes turned! Each little cake pan was filled half full, with 15 grams of cake batter. Because they are shallow, I baked at lower heat, 300°F. It took 20 minutes, and they rose beautifully to the top. Happy baking everyone, and let's see what happens next! 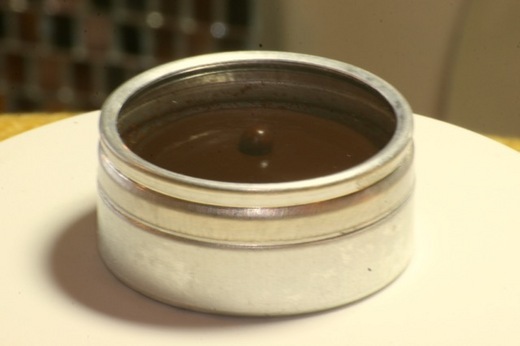 Note from Rose: Hector also told me that the little glass top of the container is just high enough so that he could add ganache and not have it smear.